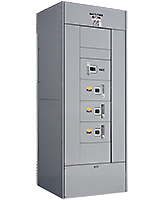 A UL listed panelboard with circuit-level embedded power metering on any combination of the branch breakers, either controllable or standard branch circuit breakers. A traditional switchboard constructed with embedded power metering on all circuit breakers including the feeder mains. A web-based interface which provides efficient accessibility to all power data for each branch circuit within the Panelboard.